A haiga by Rev. 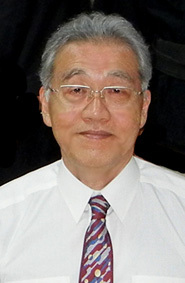 Kuniharu Shimizu. Finally, you have said you create your haiga in the spirit of Hinokishin. Please explain. Hinokishin means literally “day to day contribution.” Why contribute day to day? It is because I have tremendous gratitude to God (God the Parent in my faith) whose day to day blessings and workings extend from the top of my head to the tip of my toes. God sustains my whole life. I am very grateful for that. When I express the gratitude, I do not just pray and give thanks. I express it through actions, using this splendid body for other people, making them happy. Body to me includes talents, too. I have more than average facility in art. Why not use it to express my gratitude? Making haiga for others’ haiku is one such expression. I call it “art hinokishin.” Making haiga is, at the same time, a great pastime for me, too. What I do for the others makes them happy, and it becomes also a joy and fun for me. Isn’t Hinokishin a great way to live? Through this art hinokishin, which I began a little over ten years ago, I have collaborated with more than 280 poets from around the world. My blog is being viewed about 100 times a day, being accessed from countries like Rumania, Greece, Italy, Russia, Poland, Bulgaria, Slovenia, Croatia, France, Germany, Holland, Sweden, England, UAE, South Africa, India, Philippines, Malaysia, Singapore, Hong Kong, South Korea, Japan, China, Vietnam, Laos, Mexico, Brasil, Australia, USA, Canada, Netherlands Antilles, Trinidad & Tobago, Ukraine, and Norway. On the Internet, I introduce myself as a priest of Tenrikyo, and from time to time refer to the Tenrikyo teaching in my blog; so I think visitors, however small in number, can at least become aware that such a religion as Tenrikyo exists in the world. Among the poets I came to know through this activity, there are some who came to see me here in Jiba, and some to whom I sent Goku (sacred rice grains) and Tenrikyo publications. And a few led to actual Otasuke (saving or helping of another). So far, that is the extent of this activity as Nioigake online is concerned. There are personal benefits from this activity. My haiku and haiga get published free on printed books and magazines, not to mention getting favorable attention on many websites. I get opportunities to do design works for poetry festivals, poetry books, websites, and such. I know a lot of people now, ranging from a housewife to even a Nobel Prize candidate. And there must be other benefits that I have not noticed and have not seen yet in my life because the seeds you sow on God’s field often sprout in unexpected places. These benefits are small because my endeavor is a small, day-to-day thing. However small, they excite me and enrich my daily life. Rev. 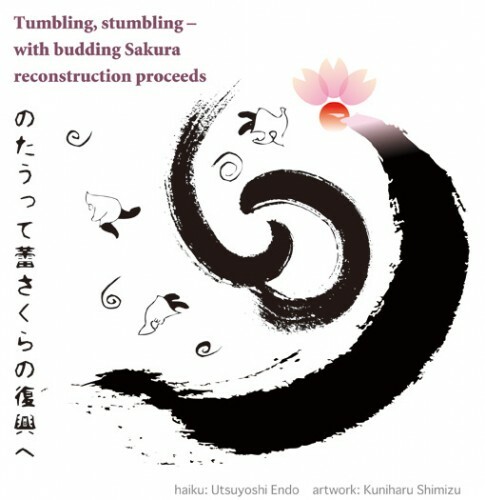 Kuniharu Shimizu publishes his haiga and haiku on his blog, See Haiku Here, which is updated very frequently. He is also a graduate of University of Hawaii. He has held various responsibilities at Tenrikyo Church Headquarters, such as: Six years at the Boys and Girls Association, where he headed Children’s Pilgrimage Section and the Publication Department. He spent nine years at the Overseas Department as the chief of America Section 1 (now North America & Oceania Section), during which time he built the original Official Tenrikyo Website. He spent three years at Doyusha Publishing Company, where he started “Skitto” magazine. Now, he heads a section that runs activities at the Oyasato-yakata South-Right Wing 2. He also has been a Besseki Lecturer for about 20 years.